Dr M V Jayaraman was an educationist par excellence, a gifted musician, a generous patron of arts, a philanthropist who gave without a second thought, a scholar, and above all, a noble human being. 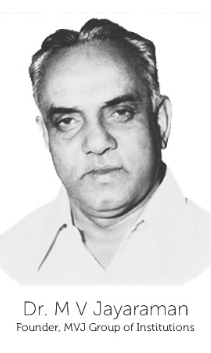 He established the Venkatesha Education Society, in 1970. And with that one act, he sowed the seeds of an educational revolution in Karnataka. Today, there are eight reputed institutions under the auspices of the Venkatesha Education Society, offering quality education in a wide range of disciplines. Dr M V Jayaraman is also the inspiration behind the MVJ Medical College & Research Hospital. His vision is what has shaped the college. His legacy is what we carry forward each day. yet never lost his humility. yet kept his feet firmly on the ground. then worked tirelessly to make them all come true. so thousands could lead a better life. MVJ Medical College and Research Hospital (MVJMC & RH) shall grow to be the premier medical institute of the country providing holistic medical education par excellence, to ensure students evolve as caring and courteous medical professionals, with excellent clinical skills and theoretical knowledge. We will endeavor tirelessly to fulfill the vision of our beloved founder, Dr. M.V.Jayaraman who believed in the adage “It’s not what you take, but what you leave behind, that defines greatness”. The mission of the MVJMC & RH is to improve the health and well-being of individuals and populations through cutting-edge biomedical research, innovative educational programs in medicine and biomedical science, and leadership in academic medicine. We strive to implement this mission with the highest professional and ethical standards, in a culture of diversity and inclusiveness, and in an environment that enables each individual to develop to his or her fullest potential. We will diligently strive to provide free and holistic medical treatment to poor and the needy patients of this remote rural area without expectation of any kind of returns or remunerations fulfilling our social responsibilities. Provide outstanding educational programs for medical and graduate students, and for training health care professionals. Development outstanding clinicians and investigators who are lifelong learners, who was provide the highest quality compassionate care, and who will serve the needs of their community and the world in the best traditions of our profession. Conduct innovative and collaborative research and integrate this knowledge into the practice of medicine. Advance the early detection, treatment, and prevention of disease. Ensure the highest ethical and professional standards in all of our endeavours.